The President’s Scholar Award recognizes a faculty member who has achieved widespread recognition based on the quality of scholarship, performance or creative activities. This year’s winner comes from the College of Humanities and the Arts. She will be honored at the 17th Annual Faculty Service Recognition and Awards Luncheon on March 15, 2016. Tickets are available for purchase. Gwendolyn Mok was destined to be a piano prodigy. As is custom in Chinese-American families, her parents gave her a Chinese name before she was born. Her name Ko-Chin translates to “Can Play Piano.” Her parents discovered that she had perfect pitch as a toddler and she began playing the piano at the age of two. 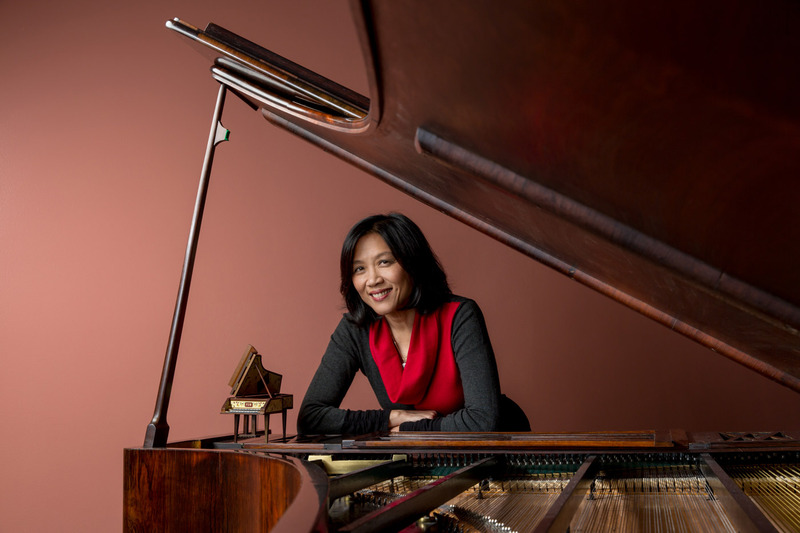 Mok is currently professor and coordinator of keyboard studies in the College of Humanities and the Arts, School of Music and Dance—and a leading expert in the music of French composer Maurice Ravel (1875-1937). However, she did return to Juilliard as a youth and studied there on Saturdays for 12 years before going to Yale University and graduate school at SUNY Stony Brook, where she first discovered Ravel’s music. In 1993, Mok received a grant from the French Ministry to study in Paris with Vlado Perlemuter, one of Ravel’s former students. She returned this fall fresh from a sabbatical that took her to back to Paris—and to Amsterdam, Vienna and London, where she visited historic keyboard collections and performed concerts. She also visited Taiwan, where she taught students from middle school to graduate school. Surrounding herself with inspiration also helps keep her going. On a trip to Amsterdam, Mok happened across a historic piano, an Erard, from the time period of Ravel and was able to play a piece on it. It brought out nuances in the music she had been unable to create on a modern piano. The Erard now resides in a special room next to her office. Congratulations to an accomplished musician, congenial colleague and good friend!